The time required for the pendulum to complete its swing is a function of its length. Swinging from a cable over 60 feet long, the pendulum’s period is just over 7 seconds. 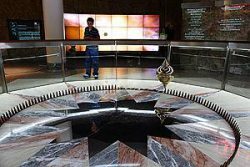 The pendulum receives the energy needed to keep swinging from a magnet surrounding the cable at its top. As the pendulum reaches the middle of its swing, it closes a circuit that activates the electromagnet. The magnet pulls the cable away from the center position. The pendulum keeps on swinging as the world turns below.